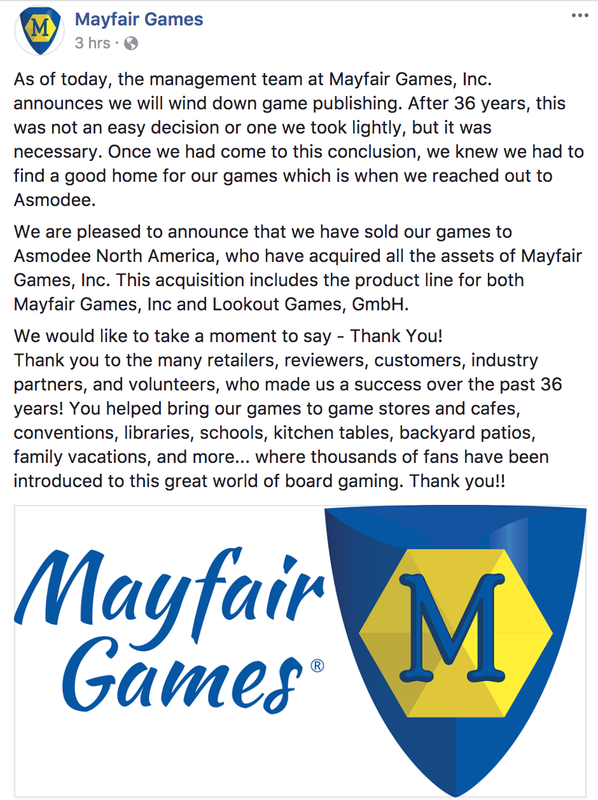 I have varied memories of Mayfair Games. While their Dark Folk adventure book was a supplement I went to numerous times, their City State of the Invincible Overlord boxed set was... lacking, But their Demons series was top notch and their Underworld RPG wasn't bad. Wasn't Chill under their label for a bit? As always, a tip of the hat to The Tavern's community for bringing this to my attention. Link to the Mayfair Games Facebook Post. Loved their DC Heroes RPG. And they were the original publishers of a few notable boardgames that went on to made a big impact in the current board game revival. That game had great support. So many modules and source books. I always meant to get a later edition to have all the updated gadgets rules and so forth. I really enjoyed their Role Aids series of adventures. "Elves" in particular provided a lot of background into the race at a time when there wasn't much other material available. WoW; don't they publish Catan? They always have a huge presence at GenCon. Isn't that game super popular? I've never played it, but have been told I should check in my Nerd Card for having not done so yet. Catan is just a license of the German Siedler game. And it is pretty old by now so it could be sales are slowing down. Mayfair hasn't published Catan since 2016. Catan is now published by Catan Studios which is a division os Asmodee. DC Heroes 3rd Ed was and is my favorite system overall. Very sad to see that company slip away. Well for some of us DCH is still alive and well with a active community. Didn't DC Heroes become Blood of Heroes after they lost the license? Blood of Heroes used the MEGS system, but was published by Pulsar Games, not Mayfair.